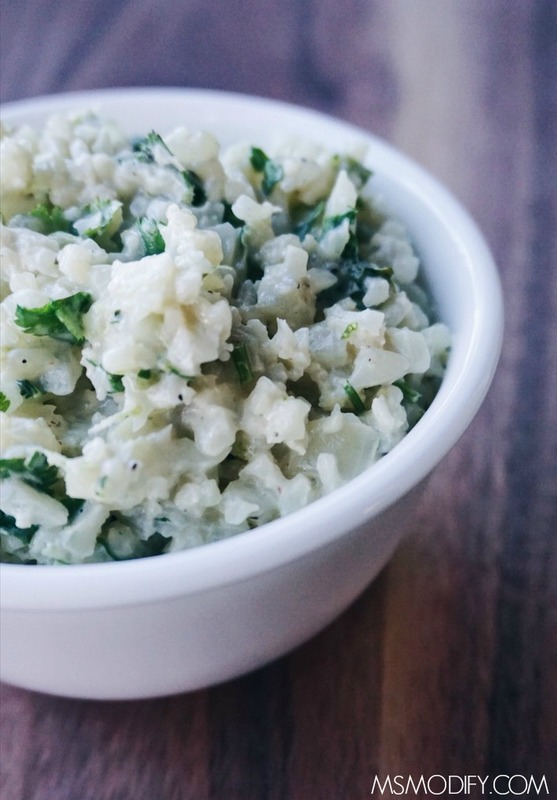 Cauliflower rice that’s simmered in coconut milk and tossed with lime zest and cilantro makes the perfect gluten free and low carb side dish! Cauliflower rice. Have you had it? Move over startchy, carb-filled white rice because cauliflower rice is giving you a run for your money! The first time I made it I didn’t tell Erik what it was and served chicken stir fry over on top… guess what? He didn’t notice until I told him and he loved it! I decided to put a twist on plain cauliflower rice by simmering it in coconut milk and tossing it with lime zest. This is the perfect addition to your meal, either as a side dish or throwing some veggies and/or meat on top! I find cauliflower rice in a bag at Trader Joe’s (in the produce section), but I’ve also seen it at Costco (it’s not so finely riced though). If you can’t find these, don’t worry… it’s so easy! Literally grab a head of cauliflower and your food processor and in less than 5 minutes you can rice it yourself! If using a head of cauliflower, add florets to food processor and pulse until it looks like rice. You may have to do this in a few batches depending on the size of your food processor. Make sure you pulse and not puree. Drizzle olive oil in a pan over medium heat. Add onions and jalapeños, sauté for a few minutes until tender. Add garlic and cauliflower rice, stir so everything is evenly mixed. Cook for about 5 minutes. Pour in the coconut milk, stir and allow to simmer for about 10 minutes or until liquid is absorbed and cauliflower is tender. Remove from heat and stir in lime zest, salt, pepper and cilantro. This entry was posted in Recipes/Dining Out and tagged cauliflower, side dish, vegetables. I’m saving this one. I’m so intrigued about cauliflower rice & what a yummy way to liven it up. I love pairing this with curry vegetables or chicken! Oh Yummy!! This looks great. I have saved this for later…I really love those combinations. Ooh what a delicious looking side dish! I need to try this with actual rice! I’ve never tried it with actual rice, I’m sure it’s great too! This looks really good. I would make it with regular rice, but I can’t wait. I love everything with coconut flavor so this should be amazing!!! Thanks! If you try it with regular rice, let me know how it turns out!